Ubisoft has today revealed that Tom Clancy’s Rainbow Six franchise will make its return this year when Rainbow Six Siege launches on October 13th for PC, PlayStation 4 and Xbox One. In addition to the release date reveal, Ubisoft have also taken the opportunity to show off the UK and European collector’s editions of the game. Naturally they’ve also commerated the occassion with a swanky new trailer which you can catch below, along with the official press release on the matter. London, UK – May 14, 2015 – Today, Ubisoft announced that Tom Clancy’s Rainbow Six® Siege, the latest in the best-selling Tom Clancy’s Rainbow Six franchise, will be available worldwide on October 13th 2015 on PlayStation®4 computer entertainment system, Xbox One, the all-in-one games and entertainment system from Microsoft, and Windows PC. Developed by Ubisoft Montreal, Tom Clancy’s Rainbow Six Siege is inspired by real world counter-terrorist organisations, and puts players in the middle of lethal close-quarters confrontations. For the first time in a Tom Clancy’s Rainbow Six game, players will engage in sieges, a new style of assault where enemies have the means to transform their environments into modern strongholds while Rainbow Six teams lead the assault to breach the enemy’s position. The Gold Edition which includes the Standard Edition and the Season Pass*. 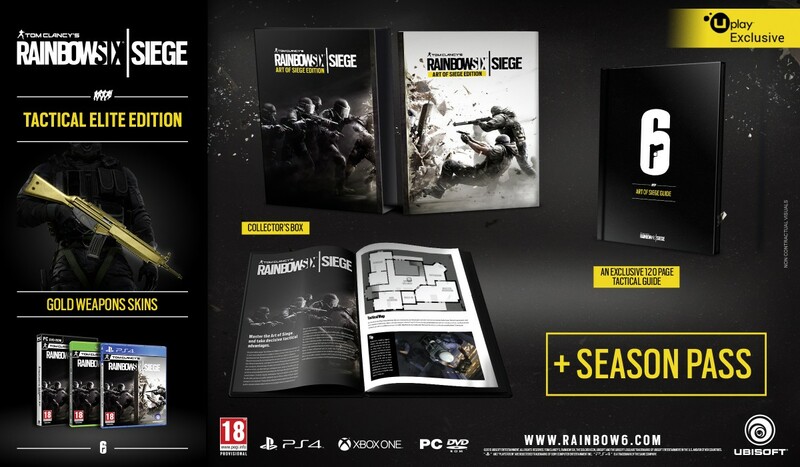 The Art of Siege Edition can be pre-ordered at the Uplay Shop and at selected retailers. For more information about Tom Clancy’s Rainbow Six Siege, visit: rainbow6.ubi.com.